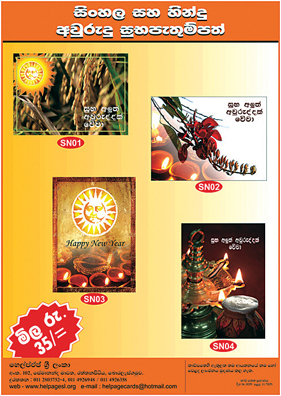 Continuing with what has become a festive tradition, HelpAge Sri Lanka (HASL), will once again be in the forefront of 'greeting' with over 100,000 New Year greeting cards on sale this year. The proceeds from sales will be utilised to carry out free Cataract Surgeries for needy senior citizens over the age of 55. The free surgeries are performed at the HelpAge Eye Hospital, Wellawatta (Opposite Savoy Cinema). HelpAge cards are available at all leading book shops, supermarkets countrywide and at the HASL Head office, No 102. Pemananda Mawatha, Raththanapitiya , Boralesgamuwa The cards have been a great hit during festive season in previous years, and a similar success is expected this year, especially given the worthy cause of helping improve the vision of underprivileged elders. In addition to the New Year greeting cards, HelpAge has a large collection of Birthday cards in different categories including for brother and sister, husband and wife, parents and grandparents, teachers, for boys and girls 21st Birth Day, New Born Babies, get- well, Sympathy, Wedding Anniversary and Thank you cards. Executive Director HASL, Samantha Liyanawaduge said free cataract surgeries are performed with the latest technology and Intraocular Lenses (IOLs) at the HelpAge Eye Hospital. For further details contact Fundraising Manager on 0112803752/53,54, 0114926358 and 4926948.